Previous Pula Imvula articles have covered using rainfall records, rainfall patterns, soil moisture conservation to evaluate the potential, sustainability and economic viability of crops in your farming environment. Another tool that can be used to maximise the yield potential of crops on you farm is the consideration of the heat units required to produce grain crops together with your long term rainfall received and also taking the soil depth and fertility of particular lands into account. The very high temperatures and very dry periods during the summer growing experienced last season has now been recorded as one of the hottest years on record in South Africa. A temperature of 44,7°C was experienced in Cape Town during January 2016. As a farmer the choice of the correct cultivars of sunflowers, maize, soybeans, dry beans and other crops is critical. One of the main factors that influence the crop production potential and in turn actual production will be the heat units experienced in any particular season. The yields realised with sunflowers planted between the 15th and 20th of January 2016, in the Eastern Free State ranged from 1 ton to 1,6 tons with the late season cultivars planted. These yields were exceptional under the circumstances with the rapid tapering off of the heat units available in the production period from January to May. The sunflower crop saved farmers from a total loss from cropping in that season. What are growing degree days or heat units? Scientists, horticulturists, gardeners and farmers discovered that there is a strong correlation between the measurement of the heat accumulation derived from the maximum and minimum temperatures experienced by both plants, animals and insects and their development in a growth season or growth phase. It is a factor that can be easily measured and used to predict when a flower will bloom, an insect will emerge from dormancy or the various stages a crop will reach from planting to maturity. The crop heat units are calculated, using the daily maximum and minimum temperature less a base temperature for each day and accumulated from planting to the harvest date. The base temperature is different for each crop. The base temperature of maize is 10°C. The formula used to calculate the daily heat units is the (maximum temperature (°C) plus the minimum temperature (°C)) divided by 2 minus the base temperature (°C). These daily amounts are recorded and added up cumulatively to show the accumulated heat units throughout the growing season. If this is done consistently for the temperatures experienced on your farm the targets as set for various cultivars can be monitored. For example, given a maximum temperature of 28 (°C) and a minimum of 15 (°C) the heat unit calculation for that day for maize would be (28 + 15)/2 - 10 equals 16,5 growing degree days (GDDs) or heats units for the day. Cold nights can really slow up the development in days to the targeted 50% tasseling date. The heat unit requirements are a good guideline but all the agronomic factors coupled with prevailing environmental conditions will determine the actual crop benchmarks reached, if you can measure your rainfall and temperatures daily. The weather bureau station near you can provide the maximum and minimum temperatures in your area. 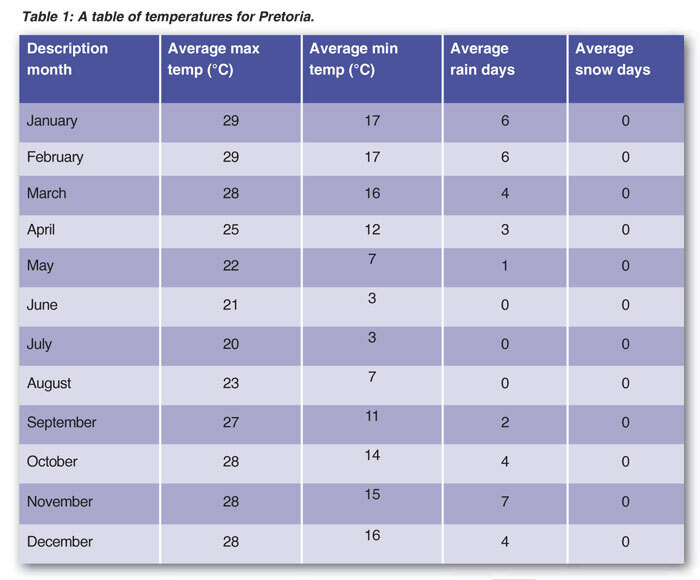 A table of temperatures for Pretoria is shown in Table 1 as an example. These can be used for farmers in that area to calculate the heat units and identify the correct cultivars to plant. Plant breeders monitor this relationship and can calibrate various cultivars of maize, sorghum, soybeans, sorghum, canola, dry beans and in fact all growing crops and plants as to how much heat accumulation is needed to reach certain benchmarked or calibrated growth stages. The studies result in guidelines for farmers in choosing the correct cultivars suited to the exact conditions experienced on your farm and the other temperature microclimates found within large farms. Companies developing and selecting cultivars show much detail such as in the seed brochures for example. They give an indication for each crop and main planting region as to the heat units and days required for a crop to get to 50% flowering from the planting date and days to physiological maturity. For example, the following cultivar characteristics or agronomic parameters shown below for maize in the Western region for dry land cultivars would indicate the heat units required to the 50% tassel stage for Ultra Early planted maize being between 685 and 690; Early 710 - 720; Medium Early 725: and Medium 730 - 735. The maize cultivars are developed to be able to grow to their full genetic potential within the above heat unit ranges shown. Work out what are the maximum heat units available on your farm. The information for sunflowers might show days to 50% flowering of 75 days, days to physiological maturity as 130, and days to harvesting as 150 - 155. One cannot then plant a long season variety with a high heat unit requirement that should be planted early during January. Consult your seed supplier so that you can be able to buy the right cultivars for your situation on your farm. You can then avoid planting a high yielding cultivar that looks attractive but that requires more heat units to physiological maturity than is available in a normal season in your farming area or the planting of a late season cultivar too early. The knowledge of heat units required and your rainfall extent and timing can be used to optimise the ideal planting dates for the cultivars chosen. The flowering period should coincide with your most likely period for adequate rainfall to ensure the best chance for maximum grain production. Keep in mind the risk that an early frost can destroy any late planted crops. Plan early so that you can have bought and stocked in your shed early, medium and late cultivars of maize and sunflowers or other crops so that you can adapt to the given rain and planting conditions for the current season having taken the heat units prevailing on you farm into consideration.